It starts with a woman going shopping on a first-world budget. With the price of everything else rising, the pressure for retailers to keep affordable prices is more competitive than ever. The modern woman can purchase the latest fashions for a portion of a high-end price. According to The Bureau of Labor of Statistics, Americans in 2013 spent only about 3% of their spending money on clothes compared to 10.4% back in 1960. Fast-fashion peeked its way into the fashion industry in the early 1990s, and has been growing exponentially. Fast-fashion giants; Forever 21, H&M and Zara are opening more stores every year, making trendy and disposable fashion readily available everywhere they can. Not only has fast-fashion sped up the fashion cycle and introduced multiple lines per brand a year, but it has also affected the environment and society in more ways that are imaginable. The World Bank states that textile dyes contributes to 1/5 of the planet’s water pollution, while the Council for Textile Recycling estimated about 25 billion pounds of clothing waste in our landfills a year. Most of the textiles being dumped are made from cheap man-made materials that are non-degradable. These environmental effects are only a few topics from a complex round of ethical issues associated with the fashion industry. Garment sourcing is mostly outsourced to Asia. Once Third World countries develop, global brands seek cheaper labor in poorer countries. Currently, Bangladesh is the world’s second largest garment supplier. The millions of poor Bangladeshi people who work in more than 3,400 garment factories that, work for close to nothing, but they would rather work, since their alternatives leave them worse off; hence the cheap labor provided by outsourcing to Bangladesh. The about 80% of the Bangladeshi garment workers are women. The garment industry contributes a significant 75% to the Bangladeshi economy and has given the women the opportunity for economic independence. However, they are forced to work 12-16 hour workdays in poor and dangerous conditions, their worker’s rights violated everyday and receive below a living wage—which is what keeps prices low for first-world fashion enthusiasts. Fast fashion retailers pressed with the velocity of trend turnover, originally enforced by themselves, is in turn dangerously affecting the supply chain. It no longer takes months from the inception of a fashion sketch to the hands of consumers; it takes a few weeks. Factory owners in Bangladesh get to pressure workers to work faster and overtime hours, which have always been complained about by workers, and are not being paid fairly or at all. Workers theoretically have the right to unionize, but factory owners and managers harass and threaten the workers to abandon their idea of a union. Many union organizers have been killed, discouraging further action from others. Workers health and safety needs are routinely neglected. Many people have been exhausted and fainted but have been forced to get back on the job immediately without being afforded medical attention. The neglect doesn’t stop there. The multiple-story buildings in which these factories employ thousands of garment workers are illegally built exposing them to danger. 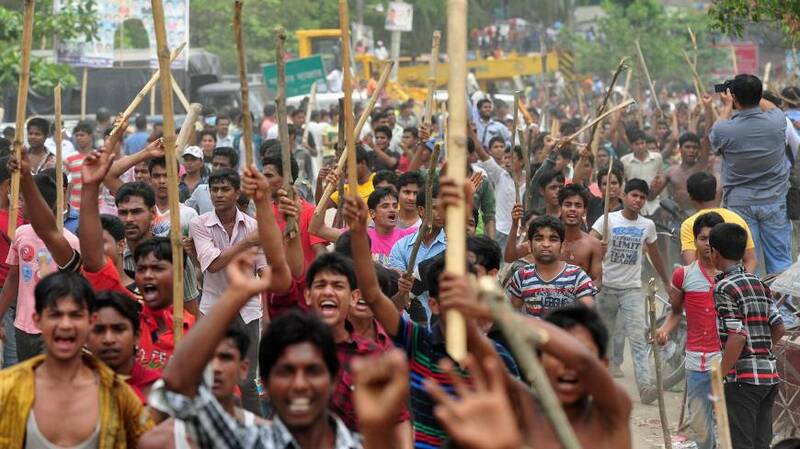 Garment factory disasters are not unfamiliar at all to the fashion industry. One of the major garment factory disasters includes the fire at the Triangle Shirtwaist Factory in Manhattan back in 1911. The owners had locked the doors to possible exits, because it was their way of controlling workers and afraid they would take unauthorized breaks. The fire killed 146 workers either through fire, inhalation or jumping to their deaths out of the building. Recently, in November of 2012, a fire broke out at the Tazreen Fashion Factory in Ashulia, Bangladesh, killing over 117 people due to inadequate emergency exits. The Tazreen Fashion factory fire is Bangladesh’s deadliest fire, from among the fires that every other day breakout in the nation’s garment factories. Collapses are also common catastrophes such as the Spectrum garment factory in Savar, Bangladesh, in 2005, that left 64 people dead and over 74 injured. “They need structural engineers and perform concrete cylinder tests…” said Adele Beppu, a doctoral candidate attending the University of Hawaii School of Architecture. Concrete cylinder tests help verify the mixture proportions for a certain strength in concrete and the time it takes before it can be put into service. On April 25th, 2015, Nepal suffered a major earthquake causing major destruction and killing over 5,500 people throughout southern Asia. Due to the vulnerability of Bangladesh’s buildings, the aftershocks of the earthquake managed to tilt a six-story garment factory in Bangshal, Bangladesh. Fortunately nobody was injured. Can this be said in the future when an earthquake actually hits in Bangladesh? The deadliest garment factory collapse however, in Bangladesh and in the entire world, was the collapse of the Rana Plaza garment factory on April 24th of 2013 in the Savar County of Dhaka, Bangladesh’s capital. The collapse killed over 1,100 and injured over 2,000 people. 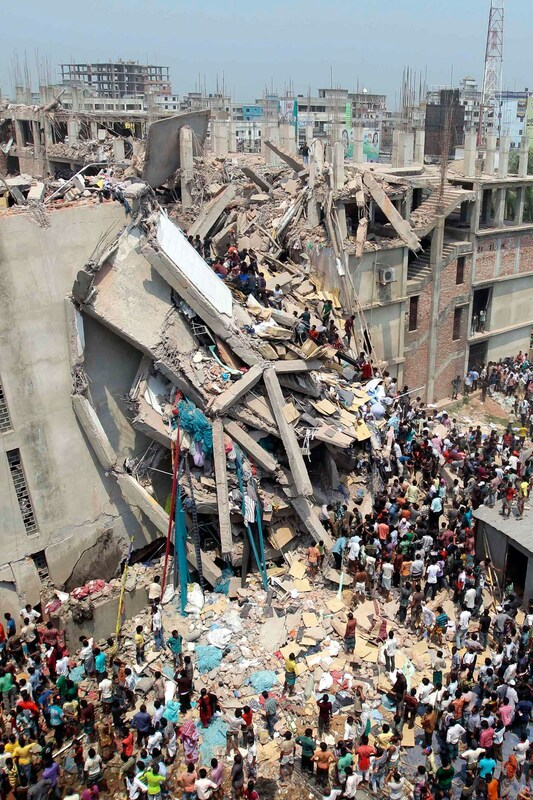 Rana Plaza was an eight-story building, which only had a permit for five. There were warning signs weeks before the collapse, when workers complained about cracks on the walls, and the authorities made everyone evacuate the building the day before. The next morning, frightened workers were physically beaten and forced to go back to work. Threatened that they would be fired and not receive their wages, people were more afraid to lose that than their life, so they went back into the building only for it to collapse an hour later. Many were stuck under the rubble surrounded by dead bodies, and the only way to rescue them was to cut off an arm or leg. Some bodies were never recovered from the debris, and many that were, were either decapitated, in pieces, or severely destroyed and unidentifiable. The collapse resulted in angry protests from workers around the world demanding better working conditions, living wages and the freedom to unionize. “Our survival is dependent on the brands and the government hearing our voices” stated a protestor following the Rana Plaza collapse. A numerous amount of factories at risk of a collapse were closed temporarily immediately after. Society also blamed multi-national companies for sourcing irresponsibly. Attention has been called for them to take responsibility and ethically source their garments. While workers are risking their lives in poor working conditions earning poverty wages, the big brands in Western and European countries are profiting billions of dollars out of those garments made from Bangladeshi workers. Trade unions an organizations have spoken out introducing efforts to protect worker’s rights and have the victims and their families compensated properly. The International Labour Organization established the Rana Plaza Donors Trust Fund, which uses donated funds to “be used exclusively to cover payments to Rana Plaza victims and their families”. On May 15th, 2013, The Accord on Fire and Building Safety was signed by “over 190 apparel companies from over 20 countries in Europe, North America, Asia and Australia; two global trade unions, IndustriALL and UNI Global; and eight Bangladeshi trade unions. Clean Clothes Campaign, Worker Rights Consortium, International Labour Rights Forum and maquila Solidarity Network are NGO witnesses to the agreement.” The Accord is a 5-year agreement that binds companies to help inspect and remediate garment factories to ensure worker safety and improve fire and building safety as well as worker empowerment to encourage them to report and refuse an unsafe working environment. But there are still many companies who have not yet signed on, including brand giants such as Walmart and Gap Inc. They opted to be part of the Alliance for Bangladesh Worker Safety along with 24 other American retailers. The Alliance works similarly as The Accord in implementing safety and structural integrity standards, but does not financially obligate companies to pay for restoration costs, only through loans. Some structural and safety improvement has occurred since 2013, and money has been donated, but two years after the tragedy, companies are still $8 million short of the $40 million compensation estimated to alleviate the victims and their families. 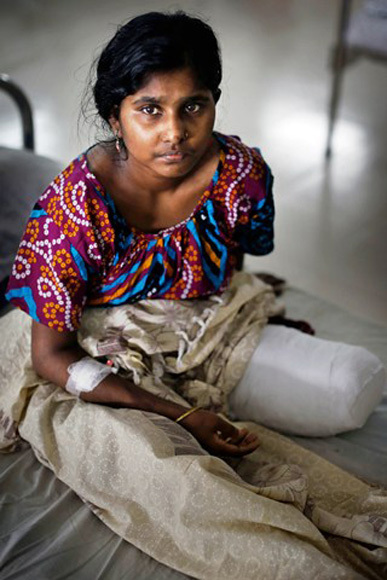 On April 23rd, 2015 the Rana Plaza victims and their families “…filed a negligence and wrongful death civil lawsuit against Wal-Mart, J.C. Penney and Children’s Place and the government of Bangladesh…” Kristi Ellis reported for Women’s Wear Daily. Fast fashion definitely has thousands of victims, but they are not the girls you see on the internet on the “street style gallery,” they are the workers who risk and have lost their lives producing cheap articles of clothing. There are many who will live in destitution and physical pain caused by their injuries, as well as permanent difficulty, due to the loss of their limbs. In that respect, there are many more fashion victims that shouldn’t be forgotten like the involuntary workers, sexually harassed women, children who are kept working as slaves and the ones who work exposed to harsh deadly materials and chemicals. There is much that needs and can be done to respect and acknowledge what goes on in the other side of the industry that helps fuel the fashion beast. Protesting action, donations and becoming active on the strong social platform that is the social media, with hashtags like #payup for the Rana Plaza victims whom have not yet been compensated by the brands that sourced from them, can be used to bring awareness. There is also #whomademyclothes, on Fashion Revolution Day, taking place on April 24th (the day Rana Plaza collapsed) with people posting pictures showing the tags of their clothes and asking the companies “Who made my clothes?” This movement seeks out companies to reach accountability, transparency and release information about their sourcing. The incessant practice of trend shopping in the First World has brought on many positive opportunities. In return, many more and some irremediable; societal, environmental, political, and economical issues have come in hand. Fast fashion did not come about in a day and it will not dissipate in the near future, but there must be a something that can be done to change its direction. The fast fashion train is moving too fast, and it is dragging innocent people along for a nasty ride. It shouldn’t be that way. It does not mean to boycott or nurture a distaste for fashion, but as consumers, it is our responsibility to educate ourselves about the supply chain of the garments that clothe us everyday. Our shopping practices indirectly affects millions of people’s lives. Our direct actions have the power to help them.